“The sky’s the limit for our core technology developed in anticipation of multiple products tailored to specific workflows, but our first focus has been on our flagship product, intellijoint HIP, custom built for hip surgery,” Armen Bakirtzian, co-founder and CEO, says in an interview with BioTuesdays. Traditionally, orthopaedic surgeons are equipped with preoperative images of the patient’s hip to help them plan what they would like to achieve in the THA. Important targets, such as leg length, offset, or the distance of the leg from the midline of the body, and even orientation of the implantable cup, are set preoperatively. According to Mr. Bakirtzian, with intellijoint HIP, a miniaturized, surgeon-controlled, 3D optical navigation camera and tracker, surgeons are provided with real-time, intraoperative measurements to assist in proper sizing and placement of the implant. With these quantitative measurements, “the device then helps align the implant in the desired location without having to rely on pre-operative imaging so cup position, leg length, offset, and hip centre of rotation are accurately determined,” he adds. With regulatory approval in U.S., Australia, Europe and Canada, intellijoint HIP is indicated for anterior, posterior and lateral approaches in both primary and revision THA, he says. The Intellijoint Surgical core technology uses a combination of hardware and software and integrates miniature optical sensors with tailored software packages to offer seamless integration into any standard surgical workflow and is compatible with every major implant vendor, he adds. As the story goes, intellijoint HIP is the result of a conversation between Mr. Bakirtzian and his orthopaedic surgeon father who voiced frustration with current navigation systems that violated key criteria important to orthopedic surgeons such as speed, ease of use, and integration with workflow. Currently, there are 1.2 million THA procedures performed in Canada, U.S. and EU annually. Hip replacement surgery generally leads to positive results. However, dissatisfaction occurs in between 15% and 30% of patients, with the most common complaint being that legs are different lengths. “With other computer assisted navigation systems, between 1.5% and 3% of THA require revision surgery with readmissions usually within 90 days of primary surgery,” Mr. Bakirtzian says. Instability and dislocation are the leading causes for revision surgery and can be a direct result of implant malposition. “Up to 8.9% of patients will be readmitted within 90 days with most readmissions due to instability and dislocations,” he adds. Using the intellijoint HIP device only adds approximately three minutes to the surgery time, he explains. 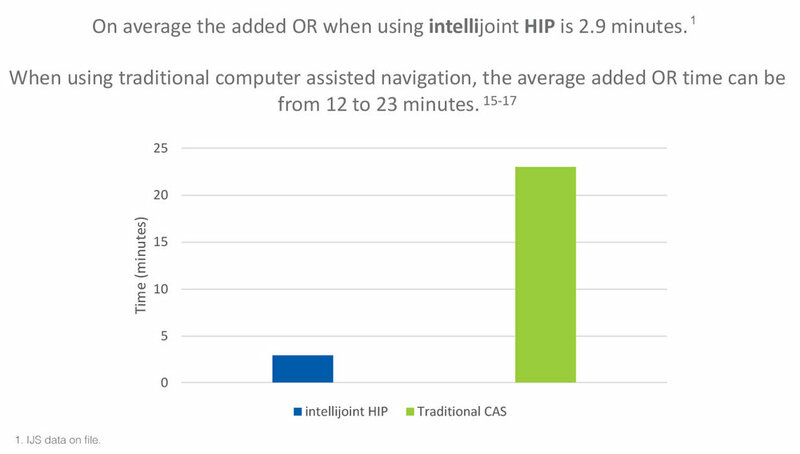 “We’ve been able to address the shortcomings of traditional navigation with a solution that has a short learning curve, and that offers hospitals a low risk, no up-front investment, pay as you go model that provides the patient with the very best possible outcome in orthopaedic surgery,” he adds. To connect with Intellijoint, or any of the other companies featured on BioTuesdays, send us an email at editor@biotuesdays.com.